The Q5® Site-Directed Mutagenesis Kit enables rapid, site-specific mutagenesis of double-stranded plasmid DNA in less than 2 hours. The Q5 Site-Directed Mutagenesis Kit enables rapid, site-specific mutagenesis of double-stranded plasmid DNA in less than 2 hours (Figure 1). The kit utilizes the robust Q5 Hot Start High-Fidelity DNA Polymerase along with custom mutagenic primers to create insertions, deletions and substitutions in a wide variety of plasmids. 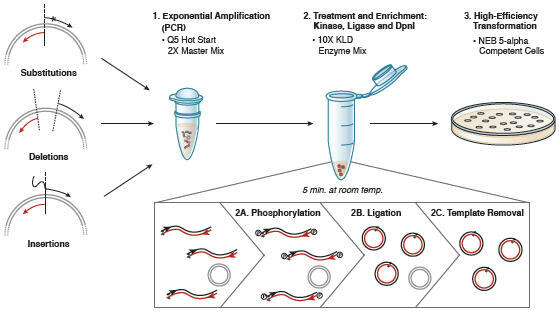 After PCR, the amplified material is added directly to a unique Kinase-Ligase-DpnI (KLD) enzyme mix for rapid (5 minutes), room temperature circularization and template removal (Figure 2). Transformation into high-efficiency NEB 5-alpha Competent E. coli, provided with the kit, ensures robust results with plasmids up to at least 20 kb in length. Figure 1: Site-specific mutagenesis proceeds in less than 2 hours. The use of a master mix, a unique multi-enzyme KLD enzyme mix, and a fast polymerase ensures that, for most plasmids, the mutagenesis reaction is complete in less than two hours. Figure 2: Q5 Site-Directed Mutagenesis Kit Overview. This kit is designed for rapid and efficient incorporation of insertions, deletions and substitutions into doublestranded plasmid DNA. The first step is an exponential amplification using standard primers and a master mix fomulation of Q5 Hot Start High-Fidelity DNA Polymerase. The second step involves incubation with a unique enzyme mix containing a kinase, a ligase and DpnI. Together, these enzymes allow for rapid circularization of the PCR product and removal of the template DNA. The last step is a high-efficiency transformation into chemicallycompetent cells (provided). exponential amplification are realized. A) Substitutions are created by incorporating the desired nucleotide change(s) (denoted by *) in the center of the forward primer, including at least 10 complementary nucleotides on the 3´side of the mutation(s). The reverse primer is designed so that the 5´ ends of the two primers anneal back-to- back. B) Deletions are engineered by designing standard, non-mutagenic forward and reverse primers that flank the region to be deleted. C) Insertions less than or equal to 6 nucleotides are incorporated into the 5´ end of the forward primer while the reverse primer anneals back-to-back with the 5´ end of the complementary region of the forward primer. D) Larger insertions can be created by incorporating half of the desired insertion into the 5´ ends of both primers. The maximum size of the insertion is largely dictated by oligonucleotide synthesis limitations. 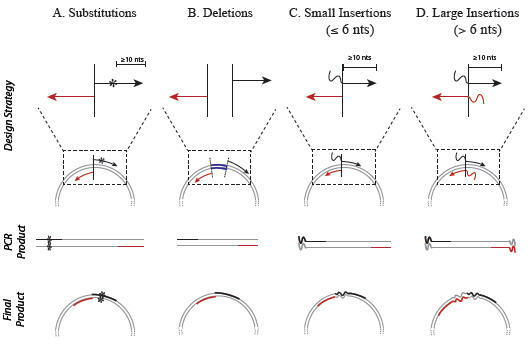 Results from a substitution reaction (4 nt) using the back-to-back Control SDM Primer Mix and Control SDM Plasmid (6.7 kb) are shown, along with results from a 12 nt deletion experiment (5.8 kb plasmid) and an 18 nt insertion experiment (7.0 kb plasmid). In all three cases, over 90% of the resultant colonies had incorporated the desired mutation(s). Results are normalized to total transformants if cells were not diluted prior to plating. For comparison, the same substitution reaction (4 nt) was performed with the QuikChange Lightning Site-Directed Mutagenesis Kit (Agilent) following Agilent’s protocol and using Agilent’s primer design tool to design overlapping primers. *Note that the QuikChange kit does not accommodate deletions and insertions of this size, so no comparison could be made for these experiments. The Q5 Site-Directed Mutagenesis Kit is stable at –80°C for one year. Forconvenience, the Q5 Hot Start High-Fidelity 2X Master Mix, KLD Enzyme Mix,KLD Reaction Buffer, Control Primers and Template DNA are packaged togetherin a separate box that can be removed and stored at –20°C for two years withno loss of activity. The SOC can be removed and stored at room temperature.It is important to store the NEB 5-alpha Competent E. coli at –80°C, and avoidrepeated freeze-thaw cycles. Kalnins et al., (1983). The EMBO Journal. 2, 593-597. How do I design primers to use with the Q5® Site-Directed Mutagenesis Kit? What should I use for an annealing temperature with the Q5® Site-Directed Mutagenesis Kit? Do I need to purify my plasmid before or after the KLD reaction when using the Q5® Site-Directed Mutagenesis Kit? What plasmid sizes can be amplified using the Q5® Site-Directed Mutagenesis Kit? What is the maximum number of nucleotides that can be inserted with this kit? What is the maximum distance that can be tolerated between substitutions? Typically, what percentage of transformants will have the desired mutation incorporated? What is the KLD Mix? Can I use my own competent cells? If I double my PCR size, should I add more PCR mix to the KLD reaction? Why is the desired mutation missing from the transformants that I screened? Why do I not see my PCR product after using the Q5® Site-Directed Mutagenesis Kit? Ensure that your primers are designed properly. To take advantage of the exponential nature of the amplification reaction, the 5´ ends of the two primers should align back-to-back unless deletions are being made (see Figure 3). For best results, primers should be designed and annealing temperatures calculated using NEBaseChanger™, the NEB online primer design software. Ensure there is a clean PCR product by visualizing 2–5 μl of the reaction on an agarose gel. Follow the suggestions below for low or impure PCR products. Only use 1 μl of PCR product in the KLD reaction. Carrying too much PCR product forward can decrease transformation efficiency. If the PCR yield is low, more product can be added to the KLD reaction, however a buffer exchange step, such as PCR purification, must be included prior to transformation. Only use 5 μl of the KLD reaction in the transformation. If more KLD reaction is added, a buffer exchange step, such as PCR purification, should be included prior to transformation. Ensure the NEB 5-alpha Competent E. coli cells have been stored at -80° C.
(μg DNA=0.0001, dilution=10/1000 x 100/1000). Ensure that the optimal annealing temperature (Ta) is used. High-Fidelity polymerases benefit from a Tm+3 annealing temp. Use NEBaseChanger™, the NEB online primer design software, to calculate Ta. Alternatively, the optimal annealing temperature could be determined using a gradient PCR followed by agarose gel analysis. Ensure that the elongation time is adequate for the plasmid length. We recommend 20–30 seconds per kb of plasmid. Ensure that the final concentration of each primer is 0.5 μm. Purify the primers with polyacrylamide gel electrophoresis (PAGE). Ensure proper design of the mutagenic primers. Optimize the PCR conditions (see above). Use 1–25 ng of template in the PCR step. A small increase in the number of clones with no/incorrect mutation incorporated can occur if less than 1 ng or more than 25 ng of template is used. 1. If resulting plasmids do not contain the desired mutation (wild-type sequence), we recommend using ≤ 10 ng of template in the PCR step. Alternatively, the background wild-type plasmids can be reduced by increasing the KLD incubation time to 30-60 minutes. 2. If there are no or low colonies, ensure that your primers are designed properly. To take advantage of the exponential nature of the amplification reaction, the 5´ ends of the two primers should align back-to-back unless deletions are being made. For best results, primers should be designed and annealing temperatures calculated using NEBaseChanger™, the NEB online primer design software. 3. If there is no or low PCR product, ensure that the optimal annealing temperature (Ta) is used. High-Fidelity polymerases benefit from a Tm+3 annealing temp. Use NEBaseChanger™, the NEB online primer design software, to calculate Ta. Alternatively, the optimal annealing temperature could be determined using a gradient PCR followed by agarose gel analysis. This product is covered by one or more patents. NEBASECHANGER™ is a trademark of New England Biolabs, Inc.
Quick Tips - How can I improve the efficiency of the DpnI digestion? Quick Tips - Why do I have so many wildtype colonies? 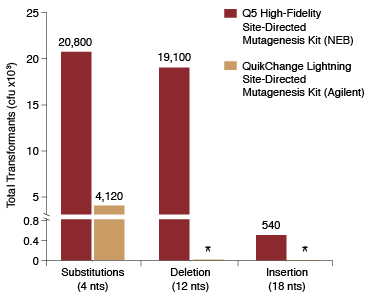 Quick Tips - Can I make multiple mutations with the Q5 site-directed mutagenesis kit? Quick Tips - How do I determine the best annealing temperature for my primers?